SeatPlan is a website which allows you to see reviews of seats in theatres around the UK so you can find the best view for you. The seats are rated by members of the public on comfort, legroom and view, with many seat reviews also featuring photos. I love finding hidden gems of seats for great prices so SeatPlan can be a great help. 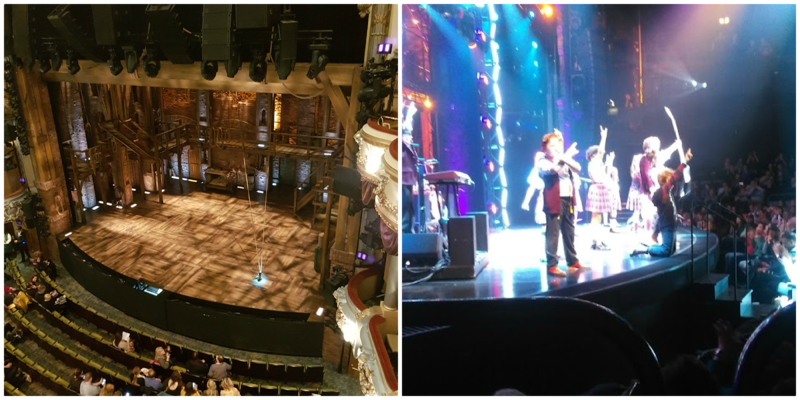 Take the two photos at the top for example: one from Hamilton at the Victoria Palace Theatre and the other from School of Rock at the New London theatre. Both of these tickets were described as restricted view and in the lowest price band but I would happily sit in both of these places again, as I thought that the view was great. If you're on a budget, it's definitely worth checking out - there's almost always an opportunity to experience a show without breaking the bank. Additionally, if you are an avid theatre-goer, SeatPlan gives you the opportunity to earn rewards by reviewing seats for them. Upload your review with photos, and in time you can claim Theatre Tokens to be spent on a show of your choice. It's a great way to help out other theatre fans while also working towards another theatre trip for yourself. Did I mention that you can also pick up some great ticket deals there too?! A website that really has it all for us theatre-lovers. I've got a lot of shows on my wish list at the moment (Eugenius! is coming back and I'd love to check it out having missed it the first time around!) so I'll definitely be checking out SeatPlan to find the best seats in my price range and I recommend you do the same!